Now Playing through August 9th – Ai Weiwei: Never Sorry at the Embarcadero, Lumiere and Shattuck Cinemas: As one of China’s most famous artists, Ai Weiwei is also one of its most outspoken critics. Ai Weiwei: Never Sorry is the first feature length film and inside story of how Ai Weiwei has inspired audiences through art, film and social media, while providing a nuanced exploration of contemporary China. Catch this film now until 8/2 at the Embarcadero Cinemas, then it moves to the Lumiere Theater and across the Bay to the Shattuck Cinemas starting 8/3-8/9. Ongoing to September 14th – Where Hearts Get Left at Fifty24SF Gallery, 218 Fillmore Street: Jeremy Fish created a visual love letter to the city of San Francisco in the form of paintings, drawings, sculpture, screen prints as well as a limited edition book. This exhibition shows the ever-changing social and physical landscape of San Francisco through the city’s characters and folktales. Fish includes imagery from his favorite legends from Imperial Majesty Emperor Norton I, to how the Native Americans believed that the Earth, and subsequently San Francisco, was created by a silver-fox and coyote as they danced in the Bay Area’s constant dense fog. On View to October 8th, Stage Presence: Theatricality in Art and Media, SFMOMA, 151 3rd Street: The fourth floor media gallery at SFMOMA has been transformed by artist Tucker Nichols into a performance space dedicated to the theatrical in contemporary art. 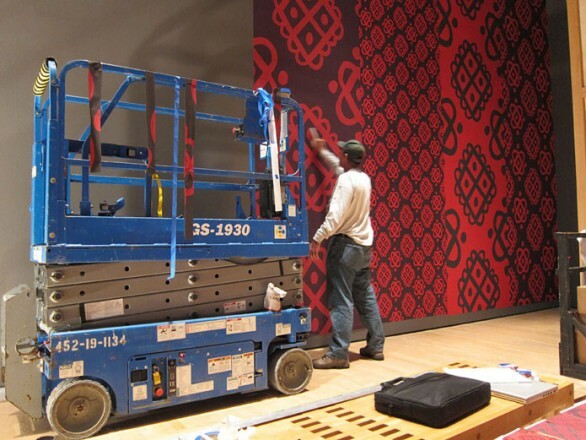 Nichols was commissioned to create oversized printed wall murals, hand-painted signage, and printed programs and posters as components of the work. While most museum performances take place in anonymous lecture halls, Nichols’ installation entitled Stage Production, presents a lively alternative venue within the museum galleries. 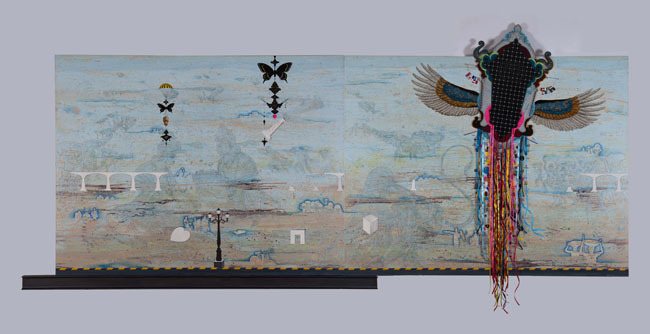 For each element of the work, Nichols has identified a particular theatrical icon and transformed it in his own way. Some upcoming performances are: 8/9, 8/11 & 8/12 Cliff Hengst: Maybe and 8/23, 8/25 & 8/26 D-L Alvarez & Kevin Killian: The Visitor Owl. For a complete list of performances click here.